Cardamom is one of my favorite spices. I love it in Indian cooking, but I also like to add cardamom to cakes, cookies, pies and breads. (Maybe this is my half-Norwegian heritage coming through, as cardamom is a common flavor in Scandinavian baking). 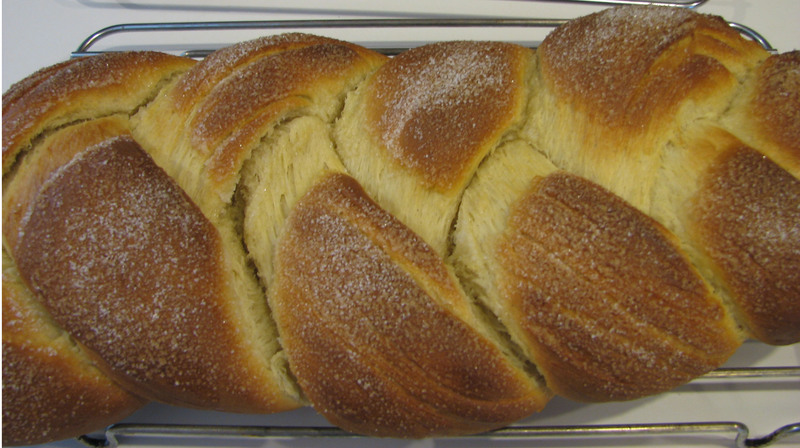 At this time of year, I especially enjoy baking this braided yeast bread flavored with cardamom. I always make at least two loaves, since it disappears quickly and a braided loaf also makes a great gift. The recipe comes from a ‘70’s cookbook called Cooking with Gourmet Grains, published by the Stone-Buhr Milling Company of Seattle to encourage home cooks to use their stone-ground flours and whole grains. Many of the recipes are quite good, and I still use them. I especially like this cardamom bread recipe, and the pumpkin bread recipe (I’ll add that one another time). Warm the milk to lukewarm (about 105°). Dissolve the yeast in the milk by stirring with a fork. In a large mixing bowl, cream the butter and sugar together. Beat in the eggs, then slowly beat in the yeast mixture. Add the salt and cardamom, then gradually mix in the flour. I use a stand mixer for this, though you can also do it by hand. Add just enough flour to make a moderately soft dough, then knead on a floured surface for 6-8 minutes, until the dough is smooth and elastic. Place the dough in a warm bowl that has been buttered, cover with a dish towel, and let rise until doubled, about 1 ¼ hours. Punch the dough down, divide it in half, and then divide each half into thirds, so that you have 6 sections of dough. Form the dough into 6 balls and let rest for 10 minutes or so. Butter two cookie sheets. Roll each ball into a 16-inch long rope (about the length of a cookie sheet), and place 3 ropes, about an inch apart, on each baking sheet. 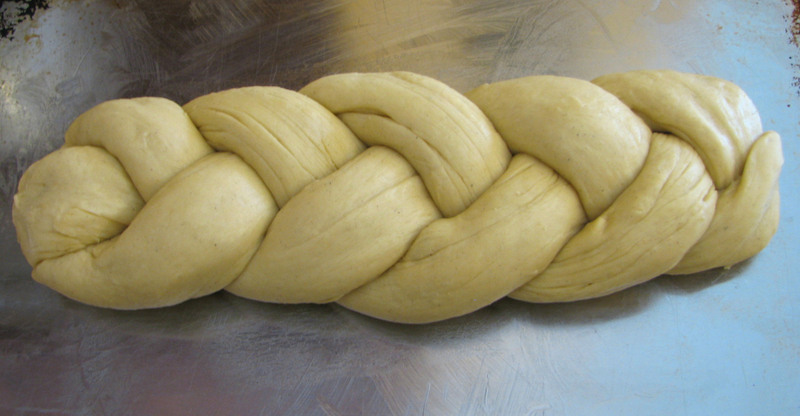 Beginning in the middle, braid the dough loosely toward the ends. Pinch the ends of the 3 strands together and tuck under the loaves. Cover and let rise about 45 minutes, until almost double in size. Preheat the oven to 375°. I have had better luck baking the loaves individually in our small-ish oven instead of at the same time. For sequential baking, brush a little milk over the loaf that you will bake first, and then sprinkle with sugar (up to one tablespoon). Put the bread on the middle rack of the oven and bake for about 20 minutes, or until deeply brown. Check the bottom of the loaf to make sure that it has browned. Cool the bread on a wire rack and bake the second loaf, (brushing with milk and sprinkling with sugar first). If you decide to bake the loaves at the same time, switch their positions after 10 minutes. This entry was posted in Holidays, Recipes and tagged braid, bread, cardamom, gourmet grains, recipes, stone-buhr. Bookmark the permalink.